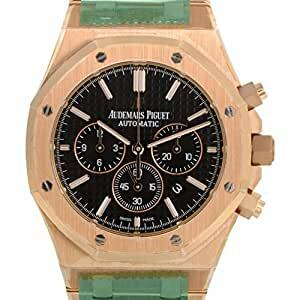 NEW FOR 2012 – THE ROYAL OAK CHRONOGRAPH APPEARS IN A NEW MORE CONTEMPORARY 41 MM DIMENSION, REPLACING THE CURRENT 39 MM SIZE.&LT;BR/&GT;ROYAL OAK CHRONOGRAPH IN PINK GOLD WITH BLACK DIAL – A HANDSOME & FITTING TRIBUTE TO THE 40TH ANNIVERSARY OF THE ROYAL OAK LINE BY AUDEMARS PIGUET&LT;BR/&GT;THIS CASE IS AT ONCE RECOGNIZABLE FOR WHAT IT IS AND YET THE WATCHMAKERS HAVE STILL BEEN ABLE TO IMBUE IT WITH A SENSE OF FRESHNESS IN CELEBRATION OF THE ROYAL OAK 40TH ANNIVERSARY&LT;BR/&GT; IT IS AVAILABLE IN STEEL AND PINK GOLD VERSIONS. &LT;BR/&GT;THE DIAL HAS BEEN REVISITED TO ACCENTUATE THE ?FAMILY LIKENESS? THAT MAKES EACH ROYAL OAK SO IMMEDIATELY RECOGNIZABLE.&LT;BR/&GT;18K PINK GOLD CASE, GLAREPROOFED SAPPHIRE CRYSTAL, SCREW-LOCKED CROWN&LT;BR/&GT; BLACK DIAL WITH ?GRANDE TAPISSERIE? PATTERN, PINK GOLD APPLIED HOUR-MARKERS AND ROYAL OAK HANDS WITH LUMINESCENT COATING &LT;BR/&GT;18K PINK GOLD BRACELET WITH INTEGRATED FOLDING CLASP&LT;BR/&GT; DIRECTION OF AUTOMATIC WINDING – UNIDIRECTIONAL – CALIBER 2385 WITH 40 HOUR POWER RESERVE.&LT;BR/&GT; WATER-RESISTANT TO 50 METERS / 165 FEET. BUY WITH CONFIDENCE KNOWING EACH TIMEPIECE GOES THROUGH THE SAME RIGOROUS 31-POINT INSPECTION. REST ASSURED ONLY AUTHENTIC PARTS STRAIGHT FROM THE MANUFACTURER ARE USED. THE CERTIFIED PRE-OWNED PROGRAM ON AMAZON ENSURES PEACE OF MIND AND TRANSPARENCY VIA STANDARDIZED REPORTS AND A 1 YEAR WARRANTY PROVIDED BY WATCHFACTS.